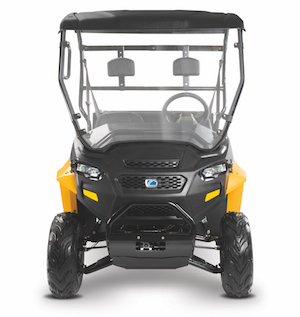 Cub Cadet’s line-up of utility vehicles continues to expand with the launch of the Challenger 400. 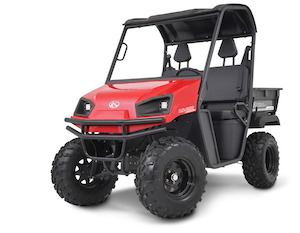 Designed to tackle a variety of jobs at home, on the trail or in the field, the Challenger 400 packs heavy-duty features and dynamic styling into a compact utility vehicle. Powered by a 404cc Subaru engine, it can reach speeds up to 25 mph and tow up to 500 pounds. The 27-inch by 37-inch 350-pound bed capacity provides the power and versatility to haul firewood, tools and camping/hunting equipment. The bed also provides a dump bed feature for easy unloading. The Sturdiest UTV Track Systems Out There! 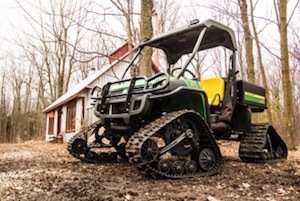 Our Kubota RTV or John Deere Gator track systems are the most robust in the industry and offer the best traction on the market. 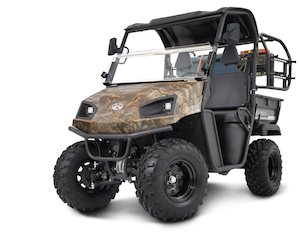 With a ground contact area four times greater than that of tires, they allow the utility vehicle to be used year-round, pushing the limits normally imposed by tires. Whether in mud or snow and for any type of work, our ST-100, ST-110 or WSS4 track systems let you get work done when it needs to get done, without having to schedule your work around weather conditions. 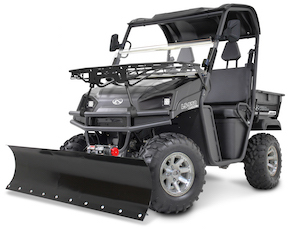 For more information on our track systems for John Deere or Kubota utility vehicles, please click on the links! In a world of wingtips, it’s a work boot. High-torque Honda 390cc engine with a 3 year warranty. Convenient CV Tech automatic transmission and Dana transaxle with locking differential for maximum control and traction. Haul up to 400 lbs. in a 9.25 cu. ft. manual dump bed, and tow up to 1100 lbs. with a 2-inch rear receiver hitch. Long-lasting LED headlights provide for better vision to weather the elements. Intuitive, easy-to-reach control panel helps you tackle any job on the fly. Heavy-duty steel bumper fends off brush, branches and debris for a comfortable ride in all terrain. Powerful Briggs & Stratton Vanguard 479cc OHV pressure lubricated 4-stroke V-twin engine with a 2 year warranty. Extra-large 25” tires allow for ground clearance up to 14” (8” to gearbox) to handle any terrain. Switch between 4-wheel and 2-wheel drive modes to handle different projects on the go. Our largest 4-stroke 674cc OHV V-twin Kohler engine with a 3 year warranty. Heavy-duty coil over shocks on all four wheels help even out rough terrain. Haul up to 500 lbs. in a 9.25 cu. ft. manual dump bed, and tow up to 1200 lbs. with a 2-inch rear receiver hitch. Three’s company. Four’s a crew. 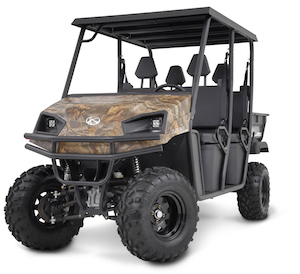 Powerful Kohler 674cc OHV 4-stroke V-twin engine with a 3 year warranty. Extra large 25” tires allow for ground clearance up to 14” (8” to gearbox) to handle any terrain. The “S” model comes standard with a steel bed and our patented rear “flip seat” option, so up to 6 people can ride.